I love stories that have a bit of wit in them. Jen Turano is one of those exceptionally talented authors who can put her characters in the most ridiculous circumstances and you more than willingly suspend belief in reality to enjoy the ride she takes you on. And what a ride A Most Peculiar Circumstance is! This is book two in a series of four books set in America in the late 1800’s. Miss Arabella Beck is a woman on a mission. She is an advocate for women’s rights and has a heart dedicated to improving the lot of those of her gender. She falls into some trouble in one of her attempts to resolve an issue and is rescued by Mr. Theodore Wilder who is as conservative as they come about the place of a woman in the home. As a private investigator though he is duty bound to return Miss Beckett to the bosom of her loving family. Little do either of them know that the sparks that fly from the beginning are only the start of a whimsical romance filled with danger and adventure. 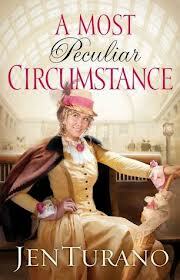 Jen Turano makes her quirky characters lovable and weaves faith in seamlessly. She take the reader on a journey and isn’t afraid to deal with the real issue of that day (and even now) of human trafficking. Not the kind of topic that lends itself to this style but Jen pulls it off with a light touch that doesn’t leave you feeling depressed at all about the ongoing problems with that in our world. If you love light-hearted stories with deep truths embedded in them, then this historical romance is a great book to read. It will leave you smiling at various points and don’t we all need reasons to do that sometimes?